"What we see and what we seem are but a dream, a dream within a dream". Paraphrased from Edgar Allan Poe, this is the opening line in Peter Weir's Picnic at Hanging Rock. In an eerie echo, the first line in Polventon, spoken to a similar cadence by Lucy Stein, is equally startling: "My grandfather built this house and died here. Every year at Mayday we come to Polventon to try to work out where he jumped." In both films, a building is framed at the start, Appleyard College and Polventon respectively. The action in each begins with a choice piece of music and in Polventon, for a while, something of the baleful nature of Stein's quest is conveyed in a series of tableaux and slow dissolves, with Stein and Shana Moulton, the two protagonists, wandering along the cliffs and sitting, forlorn, at a table overlooking the sea. In Weir's film the mystery is never resolved and neither is it in Moulton/Stein's film. It is a Greek tragedy, destined to be endlessly repeated. Yet the film has some wonderful changes of mood. The sea is a constant and vivid presence in Stein's work, including anthropomorphic use of crustaceans, who appear in various guises, notably as the result of a ritualistic incantation when the two women throw lemons into a bay and are visited by talking seafood. Rick Stein is on the end credits too, not uncoincidentally. A sly addition to the crab theme is the brief appearance of Simon Bayliss, Stein's erstwhile collaborator, who intones a puzzled query, delivered dead-pan, about crabs as human parasites. Moulton and Stein are paired, twins enacting each scene as a duo or duet. The 'Retention' in the exhibition title is an oblique reference to water retention during the menstrual cycle, a cycle which in their video becomes the recurring sea, from which both women are strangely beholden, alternatively embracing it and distancing themselves from it. If Lucy Stein's sea-based leitmotifs are in evidence, so are Shana Moulton's trademark images. The choreography, the colourful costumes, the curious objects which appear dotted here and there, the melding of one image into another. An unexpected sequence occurs when the women mimic the shape of Barbara Hepworth's sculptures, in her garden at St Ives, holes and all. What is a hole in Hepworth's sculpture and what is the hole that pierces the gyrating women, at womb level? Given that Hepworth's place in twentieth-century British art history remains a riddle, wrapped in a mystery, inside an enigma, to paraphrase Winston Churchill, then her inclusion in this film is entirely appropriate. 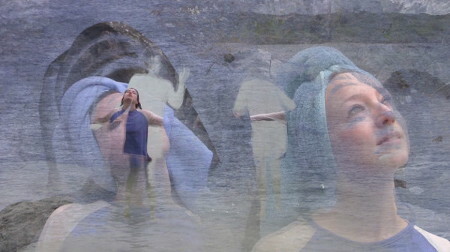 Stein refers to the film's unfolding narrative as 'a patrilineal flashback through matrilineal lines' an observation equally applicable to Hepworth, whose ambivalence towards feminism has to be situated in the context of her role as the sole visible woman sculptor in a world of hostile male artists and institutions. Shana Moulton and Lucy Stein will together execute a painting on the gallery's large window - a first for Gimpel Fils. The inspiration for this is a photo of Niki de Saint Phalle putting the finishing touches to a Nana, her iconic female figure, behind the very same window. Moulton will also be exhibiting sculptural dresses on mannequins that include video-portholes, as well as a customised hospital privacy screen. Stein will present new paintings. including an illuminated display in which her paintings become part of a three-dimensional assemblage.